The words “wallpaper removal” can send a shiver up the spine of even the most ardent do-it-yourselfer. Fortunately, many new wallpapers are printed on nonwoven substrate, making both hanging and removal easier than ever before, and some older wallpapers are peelable and strippable. (“Peelable” means that you can remove the decorative layer of the paper by pulling at an edge.) Typically it will come down in large sheets, leaving the plain wallpaper substrate behind. You can leave the substrate in place if you’re hanging new wallpaper. Otherwise, you’ll need to remove that as well. If it’s dry-strippable, you’ll be able to pull it from the wall with relative ease. If your wallpaper doesn’t come off with dry peel or strip methods, it’s time to look at wallpaper removal products. Protect your floor with a dropcloth. Perforate the wallpaper with a scoring tool. These tools are designed to not damage the wall, but don’t press too hard—just enough to perforate the wallpaper. Apply the remover to the surface in accordance with the label instructions. Wait the specified time (usually about 15 minutes) to allow the paste to loosen. 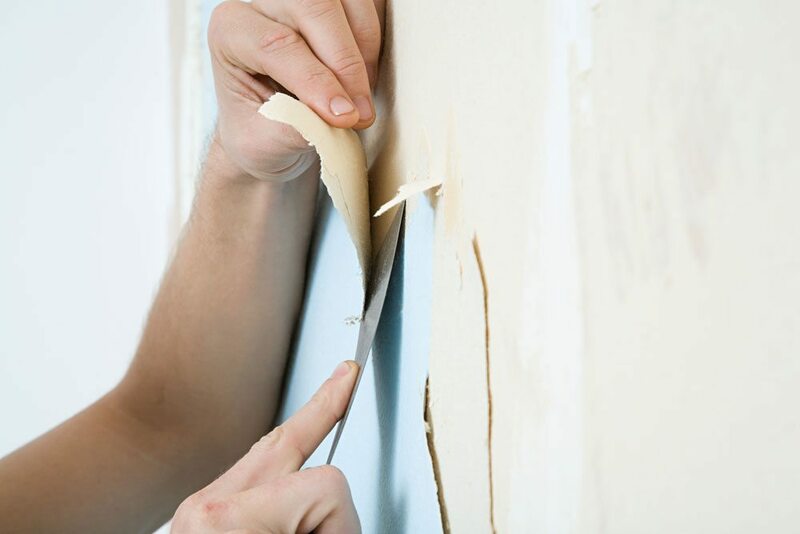 Use a wallpaper scraper to remove the wallpaper. 5 Repeat steps 3 and 4 until the paper has been removed and the paste residue is gone. Clean the wall thoroughly, using a sponge. Another option for removing wallpaper is a wallpaper steamer. There are no chemicals, and they’re especially good for removing multiple layers. You’ll need to pre-score the wallpaper for the steam to penetrate the wallpaper. Carefully follow the directions to ensure safe use, and be sure to wear the appropriate protective gear. Also, use caution around power sources; manufacturers recommend that you completely turn off the power to electrical outlets and light switches when steaming off wallpaper around them.